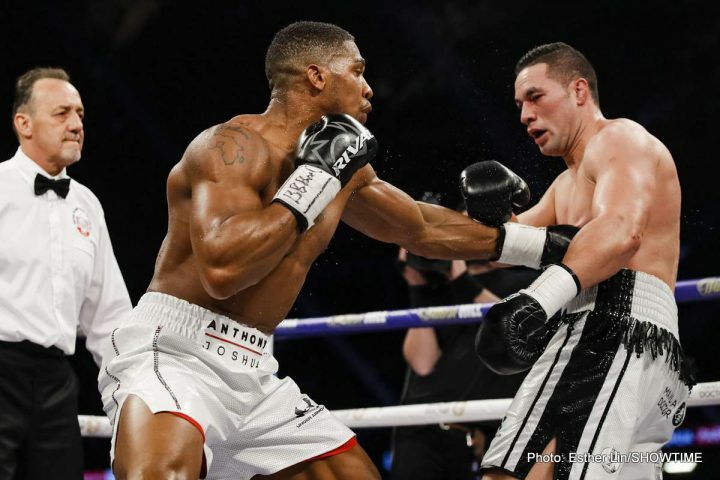 By Jim Dower: Joseph Parker (24-1, 18 KOs) wants a victory over Dillian ‘The Body Snatcher’ Whyte (23-1, 17 KO) this Saturday night to put him in position to be the opponent IBF/WBA/WBO heavyweight champion Anthony Joshua (21-0, 20 KOs) faces next year on April 13 at Wembley Stadium in London, England. Joshua and his promoter Eddie Hearn prefer that Whyte wins this Saturday night because a Joshua-Whyte rematch on April 13 would make more money than a rematch against Parker. A win for Parker over Whyte doesn’t necessarily lock him in for April 13 as Joshua’s opponent. Joshua still has recent Matchroom Boxing signee Jarrell ‘Big Baby’ Miller and Deontay Wilder as possible opponents. It’s believed by some boxing fans that if Parker beats Whyte, Hearn will pencil in Miller as Joshua’s April 13 opponent rather than having Parker face Joshua in a rematch on that date. Parker isn’t as vocal at selling fights as Miller and Deontay Wilder. Joshua can probably make a lot more money fighting either of those guys than he can facing Parker a second time, even though their previous fight was controversial due to the referee having a huge impact on the fight with him preventing inside fighting. Parker can force Joshua and Hearn to make a tough decision if he defeats Whyte this Saturday night. It would look bad if Joshua ignores the winner of the Whyte-Parker fight and faces Miller instead. Miller is taking a tune-up fight on October 6 in Chicago, Illinois. Miller’s opponent is rumored to be former world title challenger Artur Szpilka, who has suffered recent knockouts to Adam Kownacki and Wilder. Miller’s October 6 fight will be streamed live in the United States on DAZN, a streaming service that boxing fans must subscribe to in order to see. The monthly fee is said to be $9.99. It’s still debatable whether Hearn’s venture in trying to peddle fights to Americans on DAZN will be a successful one, but that’s a different thing altogether. Miller might still get the fight against Joshua anyway. Parker can help put himself in position to be in consideration for Joshua’s April 13 fight, but there’s no guaranteed that he’ll get the fight. Joshua needs popular opponents that can help sell tickets for his April 13 fight, because the seating for Wembley Stadium is being expanded from 90,000 to 100,000 for that date. They’re probably not going to want to waste their time doing that for a Joshua vs. Parker rematch, because that fight has already taken place last March. It’s too soon for Hearn to peddle a second Joshua-Parker fight to the British boxing public no matter how good Parker looks in beating Whyte. Parker, 26, needs to learn from his last fight in the UK by making sure that he knocks Whyte out. He can’t let the fight go to the scorecards if he wants to make sure that he has his hand raised at the end. The referee assigned to the fight is the experienced Ian John Lewis, who has a history of stopping fights quickly. Lewis doesn’t prevent inside fighting like the referee that worked Parker’s fight against Joshua on March 31 in Cardiff, Wales, but he does tend to jump in and stop fights prematurely at times. This means that both fighters are going to need to make sure they don’t let their opponents land consecutive shots without firing back something to show the referee Lewis that they’re still in the fight. Parker has good wheels, and he doesn’t cover up against the ropes the way some fighters do when they’re being bombarded. It’s unlikely that Lewis will stop this Saturday’s Parker-Whyte fight if one of the two isn’t badly hurt. That’s the good news. But still, you never know what kind of performance you’re going to get from Lewis. Sometimes he does a good job controlling a fight, but then he turns around and halts a match quickly while it’s still being played out. Parker lost his WBO heavyweight title on March 31 to Joshua at the Principality Stadium in Cardiff, Wales. Parker will now be returning to the UK for a second fight on Sky Box Office. Parker plans on fighting better this time to make sure he’s the one that walks out of the fight as the winner so he can be considered as an opponent for Joshua on April 13. Joshua’s promoter Eddie Hearn was reportedly hoping that the Whyte vs. Parker fight would be made an official eliminator by the World Boxing Organization, but it won’t be. The vacant WBO International heavyweight title will be on the line for the Whyte-Parker fight, but it won’t be a WBO title eliminator like Hearn was hoping it would be. It doesn’t really matter. If Whyte wins, Hearn will likely stick him in with Joshua as a voluntary challenger. As I was saying, if Parker wins, it’ll likely be Jarrell Miller that will be put in with Joshua on April 13 at Wembley Stadium. Technically, Deontay Wilder still has an outside chance of facing Joshua on April 13, but he would need to accept the $15 million flat fee offer given to him by Hearn, who feels he doesn’t rate a percent deal because he’s not a big money fighter in the U.S. Hearn says Wilder will make seven times his highest purse if he agrees to the $15 million for the Joshua fight. Wilder feels that he would help bring in a tremendous amount of money for the Joshua fight in ticket sales and PPV buys, and he wants to share in that money equally with a 50-50 deal. Joshua needs to do his part in beating his WBA mandatory challenger Alexander Povetkin on September 2 at Wembly Stadium on Sky Sports Box Office. If Joshua loses that fight, he’ll be likely be facing Povekin in a rematch on April 13 rather than the Whyte-Parker winner, Miller or Wilder. Higgins wants Parker to be the one that fights Joshua on April 13 instead of Wilder if he doesn’t take the offer. “We think Joshua is absolutely beatable. He’s a human being. We don’t think he’s near the top echelon of all-time great heavyweights,” Higgins said. Joshua has already shown in his fights against Wladimir Klitschko, Carlos Takam, Parker and Whyte that he’s not a top echelon, all-time great heavyweight. Joshua looked very vulnerable in those fights, especially against Klitschko. Joshua would have probably lost to Klitschko if the Ukrainian fighter had taken a more aggressive approach to the fight after he had AJ hurt in round 6. Joshua is beatable. It’s hard to get a fight against him to be in position to face him unless you’re willing to accept the offers that are given by his promoter. Parker probably won’t get a second fight against Joshua no matter what he does. However, a win over Whyte will help Parker’s popularity and increase his chances of getting a title shot against Wilder or a fight against one of Hearn’s other heavyweights in his Matchroom stable like Jarrell Miller. Parker’s mobility, hand speed and boxing ability might scare Hearn off from wanting to put him in against the 300-pound Miller, because he would likely out-box the slow-footed American. Miller needs slow stationary guys for him to walk down and beat. Parker is the opposite of that.